The Twin Zip promotional coin purse made especially for women with twice the function, style and fashion. 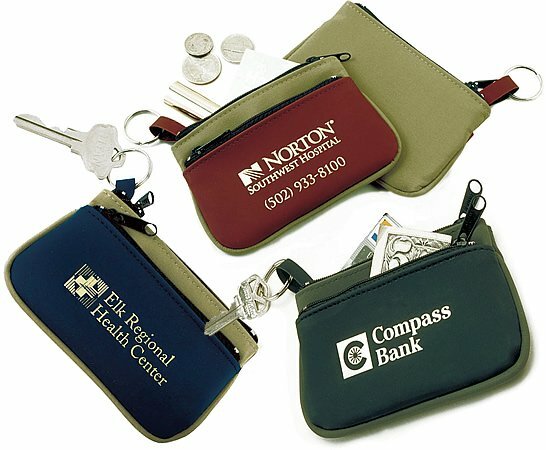 has plenty of room as a organizer for money, coins, personal items & fold back key ring strap. Three Pocket Coin Purse Colors: Khaki/Burgundy, Khaki/Navy, Gray/Black. Overall size of the coin purse is 4 3/4" w x 3 1/8" h. Bulk packaged. The price includes gold or silver imprint on the front in an area 2 1/2" w x 1 1/4" h.
The factory die charge is $50.00. Second side imprint is not available.